Phoenix's Battered Suitcases are a force to be reckoned with. One of the things that totally stands out after listening to 'Oblivion' is that Battered Suitcases are a true guitar band to the core. With a burly combination of the bluesey fuzz-fucked, roaring distortion of Jimi Hendrix and the exploding riffy sonic firepower of Ron Asheton, the sheer brawn and velocity of the guitar playing on this record is pretty untouchable. And with 2/3's of the trio being ladies, they're definitely far from a dude band. Musically they contain a unique compound of girl-gang, ferocity mixing elements of muscular poppy Rock 'n Roll bands like Suzi Quatro, the Runaways, The Muffs and The Fastback with those electrifying, visceral late 60's/early 70's hard rockin' guitar licks that brings to mind bands like Blue Cheer, Hendrix, T.Rex and the Stooges. Ya it's a total a riff fest all the way, but it's only a part of their arsenal. 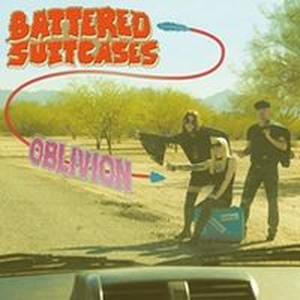 As the Battered Suitcases are fronted by an esteemed poet, Sharon Labor, who uses the band as her own poetic vessel to flex her agitated lyrical tongue. With a biting melodic snarl, her howling sultry voice works incredibly well over the fierce, sonic Les Paul attack hammering out steamroller riffs of straight up loud 'n nasty guitar-driven Rock 'n Roll. The LP includes a download card and lyrics sheet insert. Sheer Mag - III - 7"